We currently have a wide selection of bottles, jars and other items available at clearance prices. Please call with your requirements or check out the list at our Clearance Page. Wide mouth natural low-density polyethylene with a leak proof polypropylene screw cap. Excellent for handling, storing and shipping of water samples, other liquids or powders. Made from FDA compliant material. 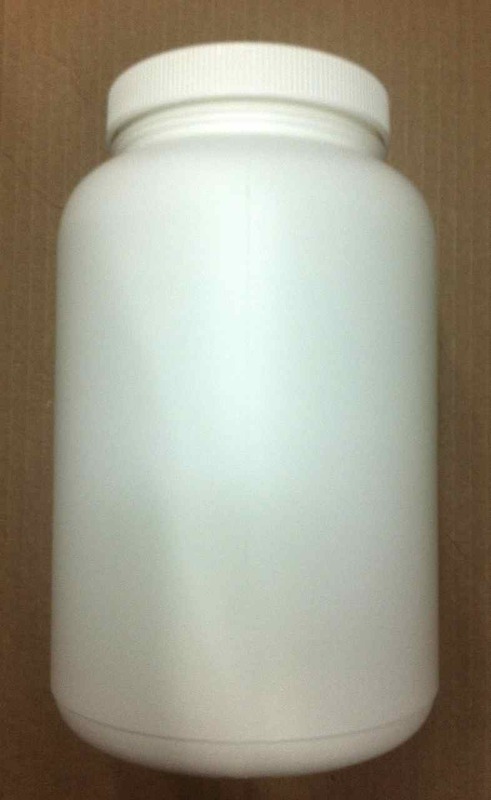 Translucent, low density polyethylene wide mouth bottles with leakproof PP screw closure. Made from FDA approved resin for use with food products. Bottles have greater flexibility and impact resistance than HDPE bottles. Excellent Chemical Resistance, Leakproof, Easy-to-Pour Wide Mouth Design. 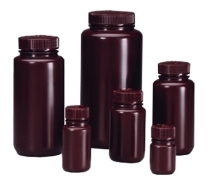 Bottles hold liquid or dry material for applications in lab or field and are suitable for shipping liquids. Can be stored in freezer to -100°C (-148°F). Excellent chemical resistance to alcohols, alkalis, and both diluted and concentrated acids. Thick walls afford durability. Bottles are translucent and produced via the injection blow molding process for exact features and bottle stability. Sample Bottles, Wide-Mouth, Amber, HDPE, Guaranteed Leak-proof. Excellent Chemical Resistance, Leakproof, Easy-to-Pour Wide Mouth Design. 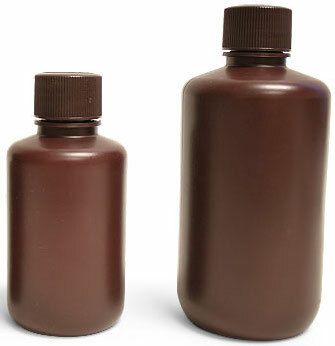 Bottles hold liquid or dry material for applications in lab or field and are suitable for shipping liquids. Can be stored in freezer to -100°C (-148°F). Excellent chemical resistance to alcohols, alkalis, and both diluted and concentrated acids. Thick walls afford durability. 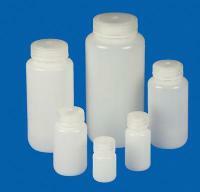 Sample Bottles, Narrow-Mouth, Natural, HDPE, Guaranteed leak-proof. Excellent Chemical Resistance, Leakproof. 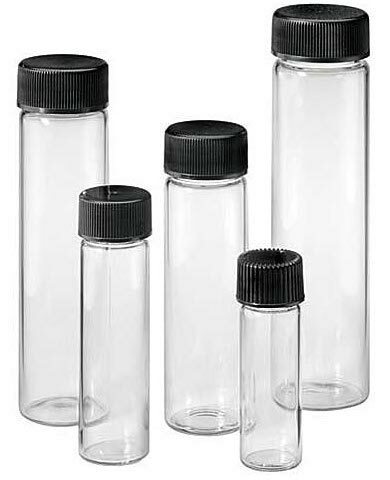 Bottles hold liquid or dry material for applications in lab or field and are suitable for shipping liquids. Can be stored in freezer to -100°C (-148°F). Excellent chemical resistance to alcohols, alkalis, and both diluted and concentrated acids. Thick walls afford durability. Store, ship, and package liquids using highly reliable and durable Thermo Scientific™ Nalgene™ Narrow-Mouth HDPE Lab Quality Bottles with Closure. 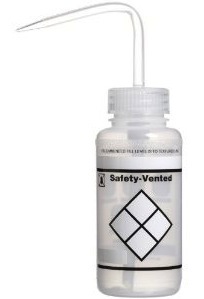 These semi-rigid, translucent all-purpose bottles are specifically designed for long-term, demanding lab use and offer excellent chemical resistance. 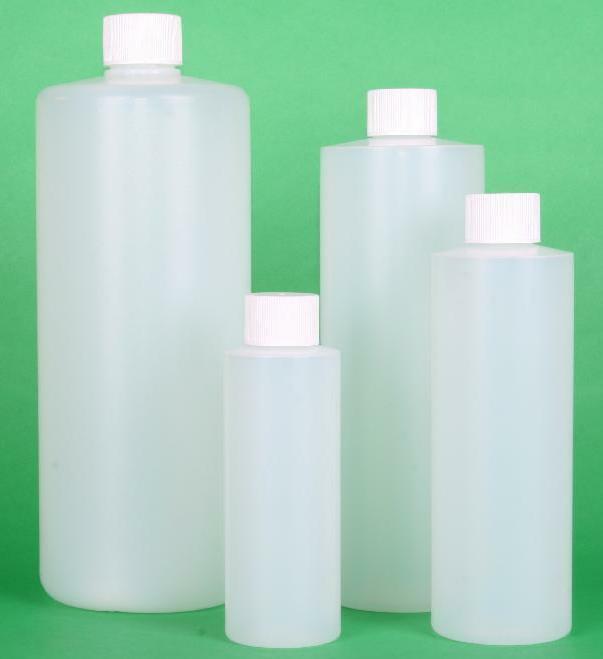 Translucent, leakproof bottles are ideal for shipping and storing liquids, solids, and semisolids. Square design saves space. With approximate graduations and polypropylene cap. Hole in cap and tab on bottle facilitate attachment of identification tags and custody seals. Excellent chemical resistance. Can be used at temperatures as high as 110°C (230°F). Excellent for shipping, storing, or packaging liquids. Bottles are made of low-density polyethylene with caps made of polypropylene. Inquire for pricing on bulk quantities. Complete with polyethylene snap-on cap. Glass-clear for complete visibility. Great for storing dry material, powders, etc. These scintillation vials fit all standard counting equipment for liquid scintillation systems. Vials fit all standard liquid scintillation counting equipment. 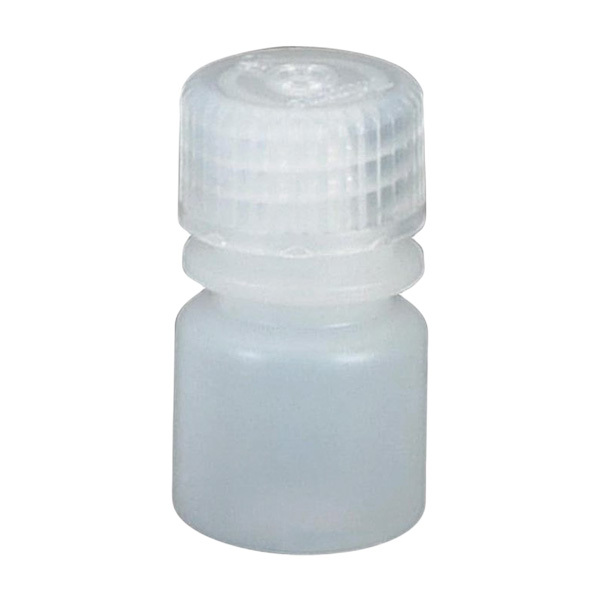 Each vial includes a white screw cap with a top suitable for marking. Ordering information: Available with a variety of caps and liners. 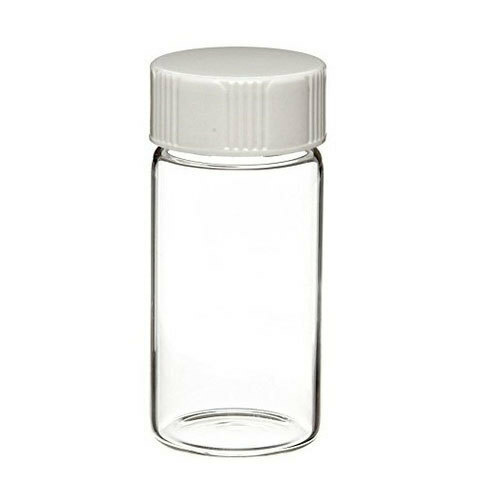 Replacement caps are available for vials. 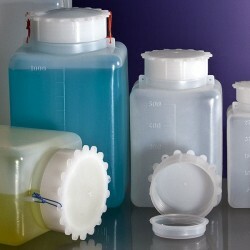 Durable, translucent containers may be used for storage or transport of most liquid or solid specimens. Tolerate strong acids, bases and most organic solvents. Graduated in both avoirdupois and metric units. Withstand temperatures -10 to 130°C (14 to 266°F) continuously or -10 to 140°C (14 to 284°F) for a short period. Each container supplied with a purple polyethylene screw cap. Sold in Packages of 25 or case of 500. 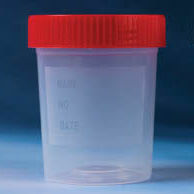 Disposable/reusable specimen containers. For use in handling soil samples, powders, liquids, solids, biological specimens, and samples. Durable, translucent, unbreakable polypropylene containers resist acids, bases, most organic solvents and common laboratory reagents. Dual graduations in oz. and ml, internally molded, easy to read. Graduated in increments of one oz. and 20 ml. 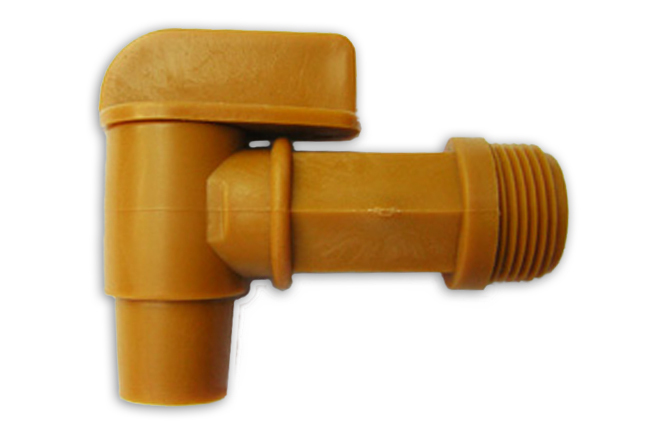 Tight-fitting polyethylene snap lid is easy to attach and remove and provides leak-proof seal. Containers and lids sold separately. 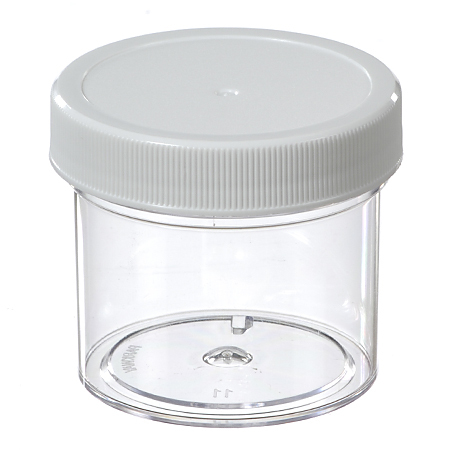 Graduated PP sample containers are an ideal choice for storing diluted bases and acids, and for applications where containers need to keep their shape after bending and flexing. As well as the storage of electronic parts that need electrical insulation. 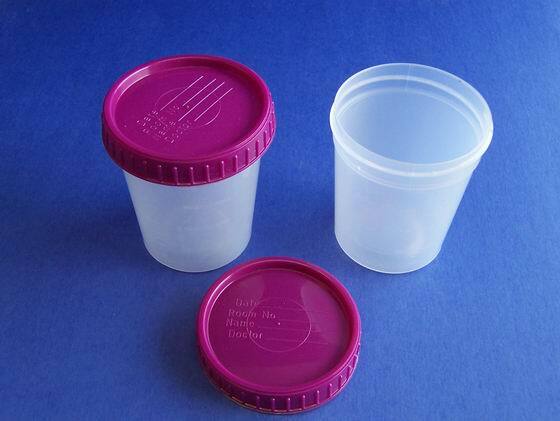 Each container comes with a PE snap cap for a leakproof seal. Containers are protected from particle contamination during shipping. Containers are enclosed in a PE bag. Complete with polyethylene screw cap and pipette with rubber bulb. 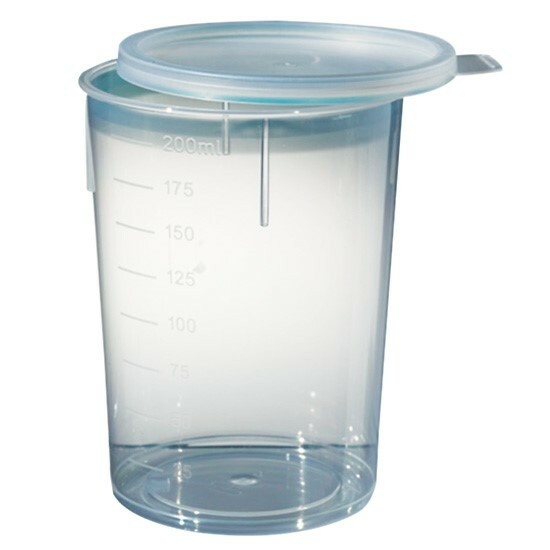 Square clear glass, 30 ml volume. Rubber bulb with glass pipet. 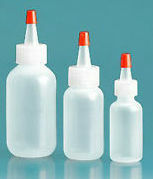 Low-density polyethylene bottles with Yorker style spouts have sealer caps that snap on easily for a tight seal. Spout openings are standard 0.76 mm (0.03″). Opening can be enlarged by cutting back with scissors. Ground glass stoppers are tapered to prevent air entrapment. Flared lip gives good water seal. Frosted area for marking sample. Supplied with white polypropylene screw caps. Convenient for storing and collecting lab supplies and specimens. Tops of C, D and E sizes are recessed for easy stacking. Autoclavable. 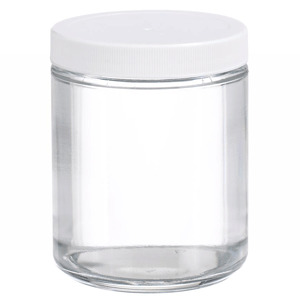 Rigid Polystyrene jars with glass like clarity and smooth slip resistant surface. Ideal for storing specimens. Polypropylene caps with foam liners provide excellent sealing and good chemical resistance. 12 Remaining - Discontinued when stock runs out. 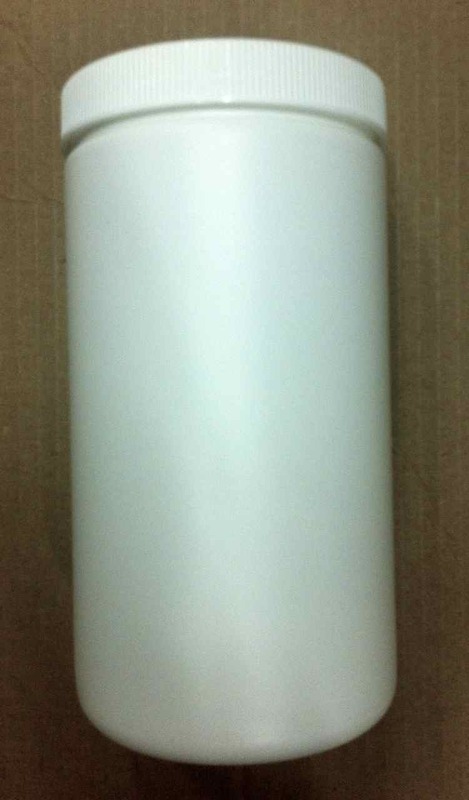 White in color, LDPE, suitable for storage of specimens or chemicals. Complete with screw on lid. 500 ml and 1000 ml size do not have a shoulder. AC Round Bottles have a taller and narrower profile than Straight Sided Jars. These bottles come packaged in convenience packs with caps attached. Clear Glass with Plastic Screw Caps. For sample storage. Flint glass with Polyvinyl lined caps. Available in 125, 250 ml 500 ml sizes. 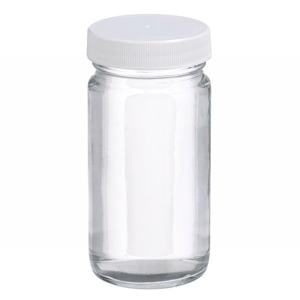 Straight Sided Jar, Clear Glass with Plastic Screw Caps. For sample storage. Flint glass with Polyvinyl lined or Teflon faced polyethylene liner caps. These polyethylene carboys have extra heavy walls for long life and dependability. They are lighter than glass, easy to handle and resistant to corrosive acids and alkalies. Use for leak-proof shipping and storage. The spigot requires only a half turn to open or close. 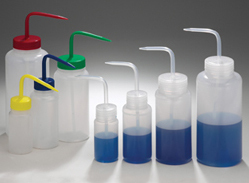 These low-density polyethylene wash bottles have wide mouths for easy filling. Caps provide single drop or needle sharp stream. Available in three sizes. 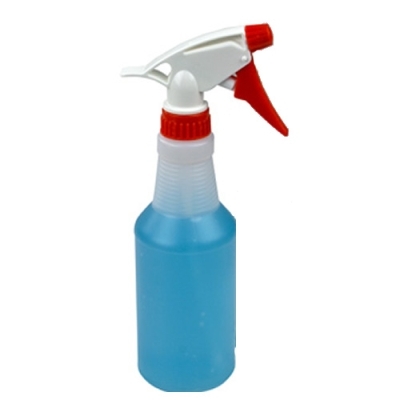 Bottles are durable, chemical-resistant, squeezable, and easy to clean. Color coded wash bottles have color-coded caps, which provide quick, safe identification. Color-coded, wide-mouth bottles are ideal for the quick identification of the many solutions and reagents needed in your lab. One-piece colored cap and nozzle are polypropylene. Delivery tube is polyethylene. Available with red, yellow, green or blue cap/nozzle. 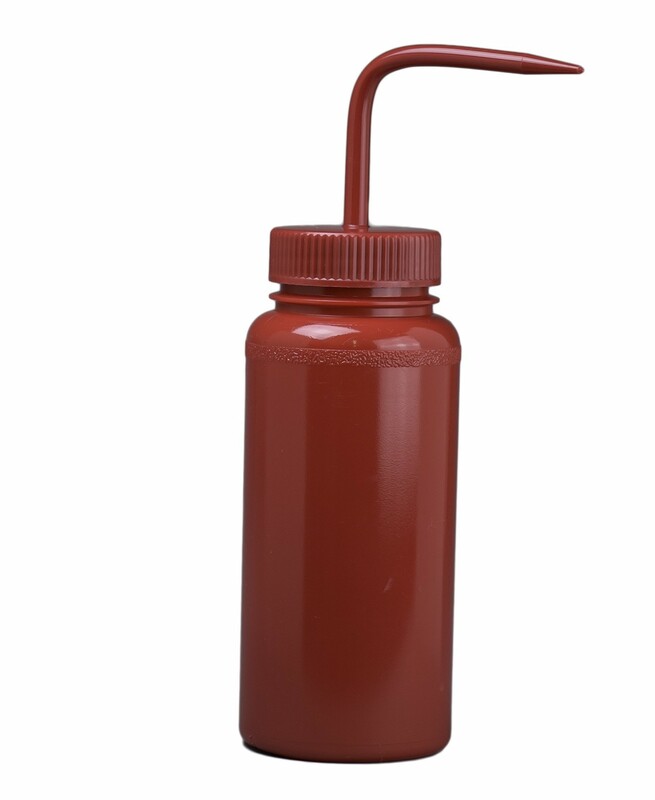 When ordering use code SIZE-COLOR-WM (for example 250 ml red would be 250-RED-WM). The bright red color helps identify hazardous contents. Low-density polyethylene with polypropylene closures. 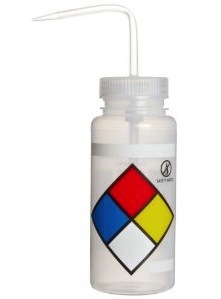 500 ml safety labeled wash bottles, color-coded for instant recognition. Available for a variety of chemicals including; acetone, distilled water, ethanol, Iso-propanol, methanol, saline, water and others. Inquire for other wash bottles not listed (all are also available in 1000 ml size for $7.35). 500ml Capacity Low Density Polyethylene 4-Color Wide-Mouth Safety-Vented "Label Your Own" Wash Bottle. These low-density polyethylene wash bottles have wide mouths for easy filling. Caps provide single drop or needle sharp stream. 250ml Capacity Low Density Polyethylene Wide-Mouth Safety-Vented "Label Your Own" Wash Bottle. These low-density polyethylene wash bottles have wide mouths for easy filling. Caps provide single drop or needle sharp stream. Fits 3/4" and 2" drum bungs and easily removes lids from standard open head plastic pails. Made from durable high strength green fiberglass filled plastic. Corrosion resistant. This non-sparking wrench fits both 2" and 3/4" drum bungs for 55 gallon drums. This self-venting pump is constructed of the highest quality polypropylene for use with a wide variety of chemicals. Unique lever-action delivers approximately 10 ounces per stroke, with the capability of 6 gallons per minute. Fits standard 2″ drum. 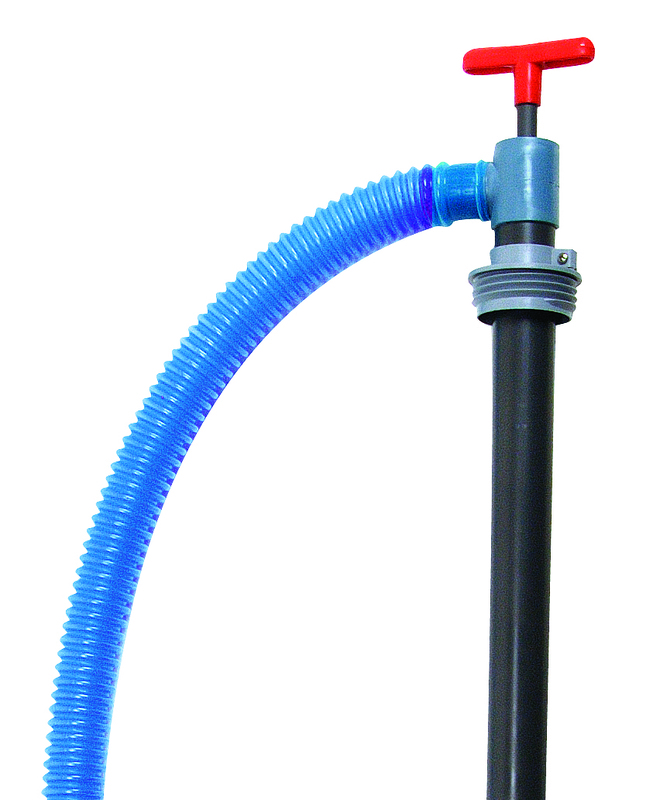 Telescoping extension tube allows use with all 15-, 30- and 55-gallon. Spigot orientation of 360 degrees permits versatility in. Extra-heavy construction and quality material provide long service life. Compact and lightweight. Completely assembled except for extension tubing. Lock nut provided to hold pump firmly in drum. Tip, drain and store 55 gallon steel drums. - Retractable tipping lever for easy loading and unloading. - 3" polypropylene wheels for mobility. 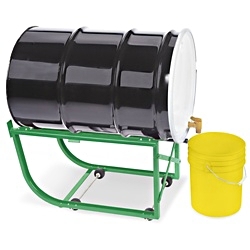 55 gallon drums up to 1,000 lbs. with ease. - Deep lip frames help stabilize drums. Polypropylene casters. This gold faucet has a 5/8 inch bore, 3/4 inch NPT inlet and fits 3/4 inch bung openings. 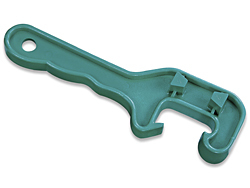 This polyethylene drum faucet does not require a gasket. Not recommended for use with flammables or temperatures above 125° F. Made of FDA compliant material. 1/2 turn, positive on/off control.